This is the third time I made this dish and every single time I get lots of compliments for this dish. 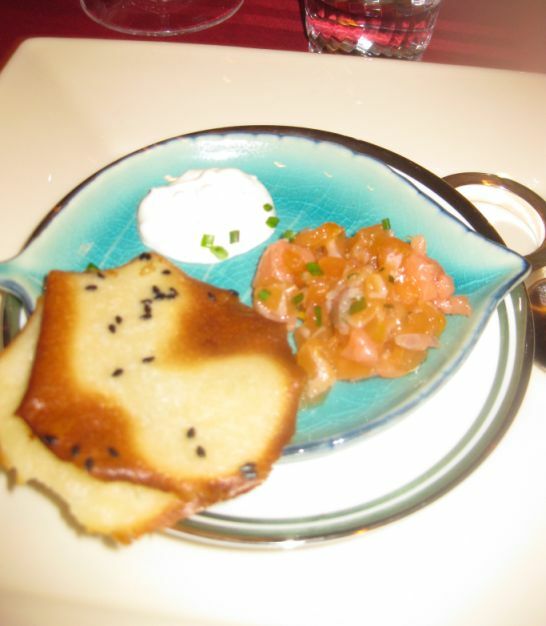 This amuse bouche is a recipe from the French Laundry but I alternate it a bit from cornet shape to a flat tuile shape. The first time I had the cornet was at the French Laundry back in 2006! At the French Laundry the servers brought to the table a beautiful tray with white napkin-wrapped salmon tartare cornets nestled inside. The presentation was gorgeous but duplicating it a home was bit difficult for me. 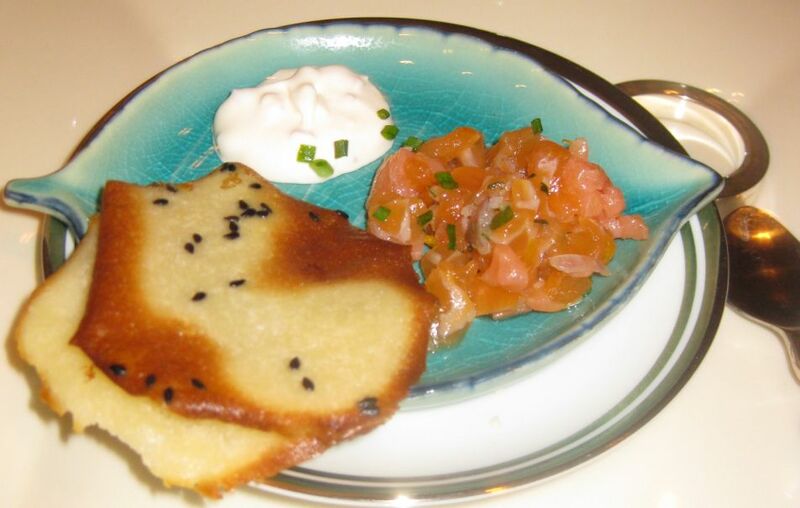 Molding the dough into cornet (click on link how it was made) was extremely challenging because the dough is so hot and so difficult to handle so I opted for the alternate method of serving the tartar on a flat tuile (roof title in French) instead. Serving the dish on a flat tuile instead of cornet does not affect the taste of the dish at all, it does not have the wow effect as it was served at the French Laundry but it is close enough. 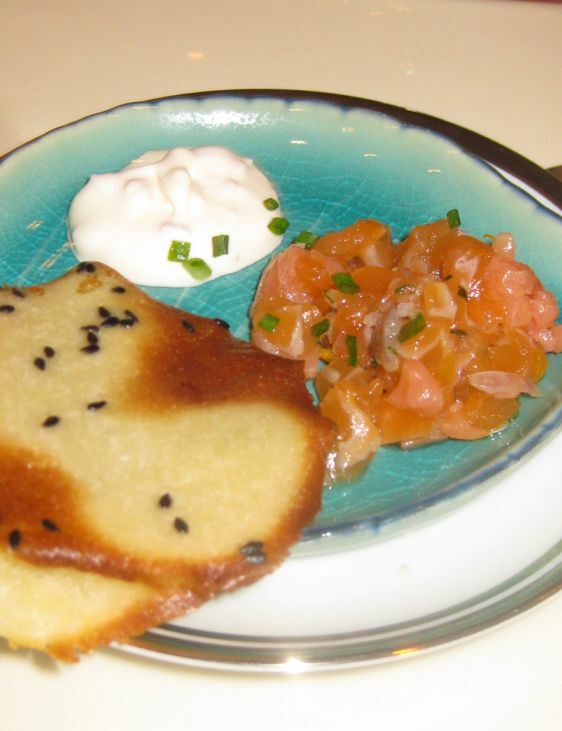 The tuile is rich, buttery, a bit sweet, crunchy and is perfect will a scoop of marinated salmon tartar and a doll up of crème fraîche and sweet onion. 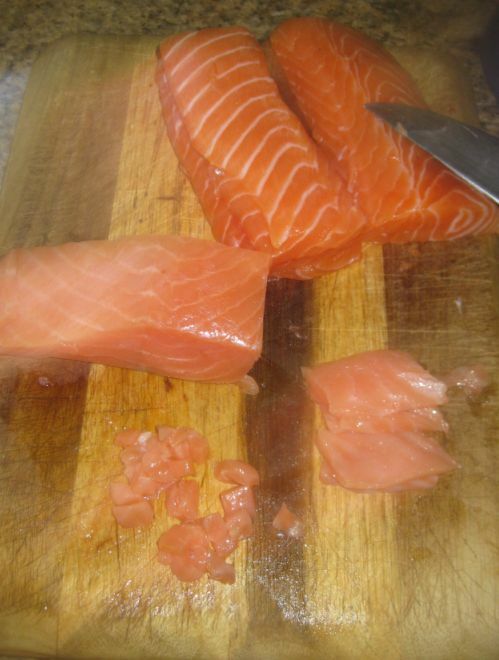 Cut the salmon into small cubes. 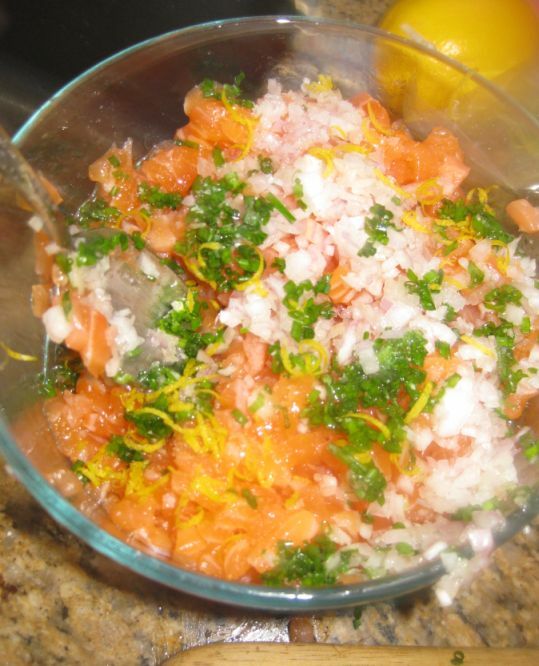 Put the salmon in a bowl with some olive oil, lemon oil, minced chives, minced shallots and a pinch or two of salt. 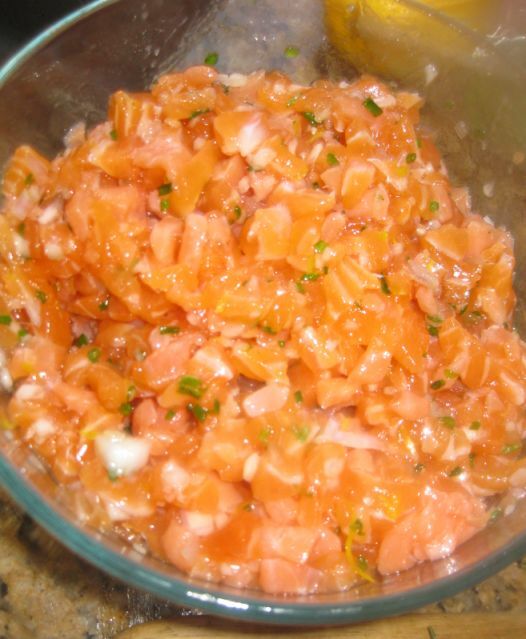 Mixed it together before covering it with foil and refrigerating it for about an hour. 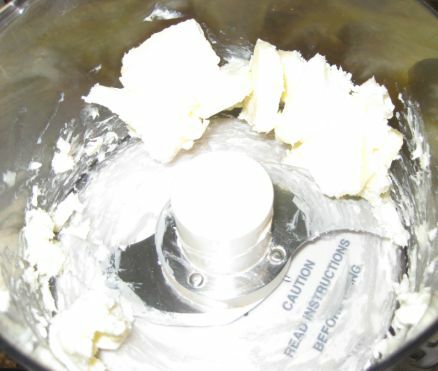 Making the batter by putting the butter into a food processor until the butter is smooth. 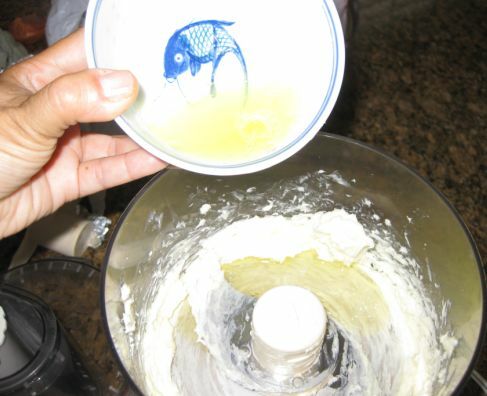 Adding 2 egg whites to the butter and zapped until smooth. 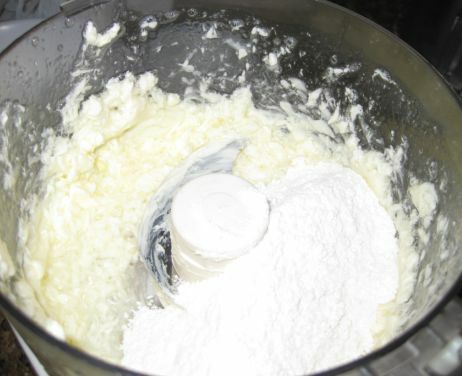 Adding the flour to the mixture. Again zapping until the whole thing is smooth. 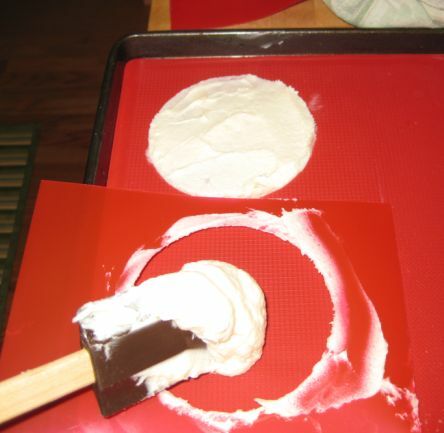 I have to create a 4" round stencil, I placed the stencil onto a Silpat and spread the batter using an offset spatula. 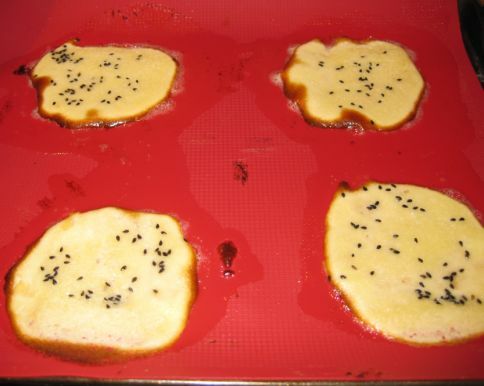 Black sesame seeds are sprinkle on top to the batter. I can only make 6 at the time. The tray goes in the oven for 4 to 5 minutes Check your oven because the tuiles gets burned pretty fast. 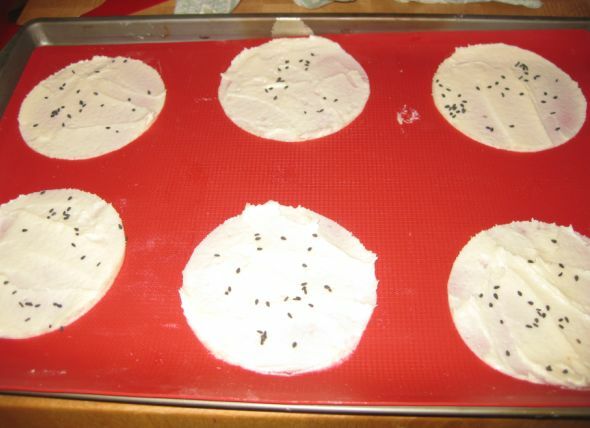 Remove the tuiles from the oven and let them rest on a cooler rack. 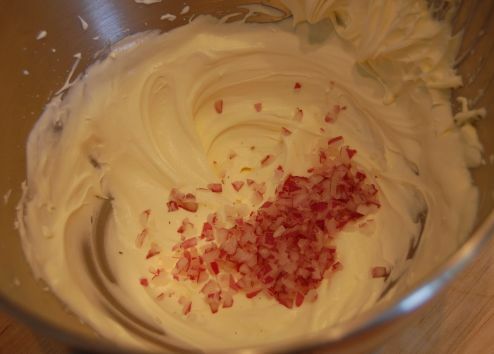 The last thing to make is the red onion crème fraîche. 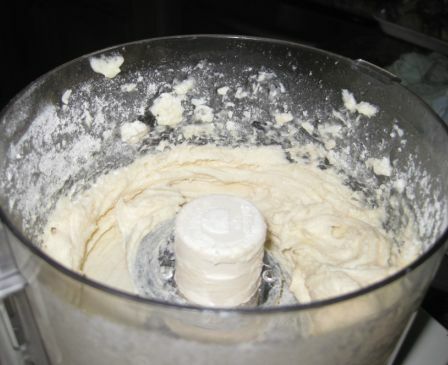 I put some crème fraîche in a mixing bowl and whisked it by hand until it had soft peaks.